For assistance, contact iTunes Support at www.apple.com/support/itunes/ww/. Your Apple ID may be associated with too many credit cards. You are trying to buy something that you are not allowed to buy. For instance, some apps or content may not be available for all countries. Your account information may not be matching the credit card information on file with your bank. The best way to resolve this is to contact Apple, as the error message suggests. Please follow the steps below to contact Apple. 6-Select how you want to contact Apple: email, chat or schedule a call. Choose one and contact Apple. You can email Apple support by selecting the Email option. Apple will reply promptly via email. You can schedule a call date and Apple will call you or you can start a live chat session with Apple support. 1-Tap Settings > iTunes and App Stores > Apple ID > View Apple ID enter your Apple ID and password then tap OK. View ‘Payment Information’ and make sure that payment account information is correct and up to date. Enter your security code and expiration date. 3-Log out of the iTunes store by going to Settings > iTunes & App Stores > Apple ID > Sign Out. Then sign in. 4-Go to Settings > General > Restrictions. If you enabled Restrictions previously, make sure that you are allowed to (a) access ‘iTunes Store’ and (b) make ‘In-App Purchases’. iOS 12 has changed the “Restrictions” settings. Now it is called Screen Time. Simply tap, Settings > Screen Time > Content & Privacy Restrictions > You will need to enter your password which is your old Restrictions password > iTunes & App Store Purchases and Allow “In-app Purchases” and “Installing Apps”. If you are still having issues, you may want to contact Apple. Apple offers live chat support. I have the same problem but its only for one application, if i want to but any other application it works like a butter smooth. Do any one else have the same issue. If yes then please help me to resolve this one. Same issue. Blocked me from purchasing in game app after I did like say 3 purchases regardless of amount spent. Same thing… I know it’s old three but did anyone ever get it fixed? Idk… Its happened only in the game. Like me, when I tried to buy some bundle in the game. stuck! I did some test, I just bought a song, and its working. and they will fix it very fast and easy !!! Unfortunatley I CAN purchase from the store itself. 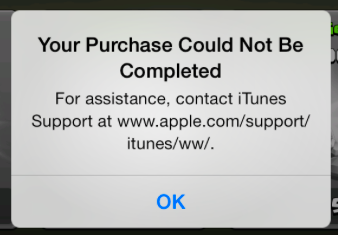 I CAN buy a song, I CAN buy an app what I CANNOT do is buy within the app…. Just because it doesn’t help you doesn’t mean you should make a bad remark of it. You’re not using your common sense. Please use it the next time an article doesn’t help you. We had the same exact issue and called…not email…the iTunes support hit some magical button and it was fixed in minutes…after troubleshooting for a total of 2 hours. It’s worth calling! They were really nice, too. Please help me. I can not purchase in township game. Is it a must to use my account detail in purchasing an app,can’t I be charged directly? I want to purchase something but it says I can’t but why? Already purchased niece now trying for the second time. Does anyone how to do that? Can it be the credit card ran out of money? Same problem. I contacted the support then talk with them and after that they account was blocked. My apple ID was disabled. Annoying! If you are playing a game on your phone and you get this message it has nothing to do with your credit card information. Apple just wants you to purchase a higher tier to continue playing the game. I selected .99 cents to keep playing my game and it was denied. Then I selected 4.99 for lives to play my game and it was denied. Then I selected the 9.99 option and it took it. Apple was wrong for this. They are forcing to pay more to keep playing. This was not a mistake on apple’s end. Not by a long shot. Along with the shotty charger they have. I’m trying to purchase $159 on Game of War, it’s the biggest pack to buy and it’s coming up with this message. I have used 15$ in my game “Growtopia” and It just stole my money, I bought the gems and it says I have spent all 15 credits but no currency has arrived please If you can, Refund me as soon as possible. I just bought iTunes cards and tried to use one and iTunes wouldnt take it why they said to notify you guys what do i do now? GG, Game players I have a Same issue. I contact Apple and they give me guide how to change ID, And how to change your credit card nothing happen, it’s just saying Purchase Could not be complete. For sake of God how could this happen. I can’t buy anything in app purchase with my credit card. Please kindly check it for me? How does posting here help? Read the damn post and follow the instructions. This is not an Apple support page dude! I just cannot purchase in my apple account. ForeFlight App purchase could not be completed. I can’t make purchases? PLEASE HELP!!?? I’m trying to purchase something on Fortnite but it says purchase cannot be completed. I have the money though. I tried purchasing something inside a game is it said “attempting to restore purchase data” I tapped, then another box popped open saying “market payment details could not be verified”. I purchase from this game many times before and it now pops this up. i talked to apple tech support,they said nothing is wrong and they could not help me fix the problem and I contacted the game support and they just redirect me to apple after saying everything goes through apple. I’m wondering if its something to do with my phone. I’ve tried changing my card info to none trick. I’ve tried to shut down my phone and that didn’t work. I even reinstalled the app. I keep getting this message when i go into the game lobby and into the the game shop without even purchasing anything. if anyone knows how to fix this problem would be great. same here.. though i created a US itunes acc and linked my US paypal to it..